7月8日 WaMu Theater -Seattle, WA / U.S.
^ a b c d e f g h i j 近藤明子、藤野洋子 (1999-04-01). 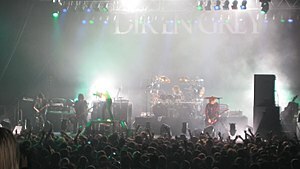 “Legend of Dir en grey −5人の歩み−”. ARENA37℃ Vol.199: 5-20. ^ "Top Independent Album" (March 17, 2007). Billboard Magazine.